Following the first round of voting, ArtPrize visitors have selected the twenty finalists, five entries from each category, that will join the Category Jurors’ picks for the chance to take home $500,000 in cash prizes. GRAND RAPIDS (Michigan) September 30, 2018 — ArtPrize, the international art competition recognized as one of the world’s largest annual public art events, today revealed the public’s top picks for the tenth annual event at the Public Vote Final 20 Announcement presented by Consumers Energy. These twenty artist entries will move on to Round 2 alongside the Category Jurors’ twenty picks announced last week. These forty artist entries continue with the chance of winning $500,000 in prizes, including the $200,000 Public Vote Grand Prize presented by Meijer. Concurrently, ArtPrize announced the winners of over $25,000 in Independently Organized Awards. Round 1 Voting closed last night at Midnight, with 27,913 voters casting 222,786 votes votes for their favorite art. Visitors elevated five ArtPrize entries from each category — 2-D, 3-D, Installation, and Time-Based. These 20 entries will move on to the second round of voting, which will continue through Thursday, October 4. Round 1 Voting results were verified by KPMG, the Official Auditor of the Public Vote. The Two-Dimensional Public Vote Award is presented by Edward Jones. Best Feature Film: Love, Gilda by Lisa D’ Apolito, determined by public vote. Organized and sponsored by Studio C.
Best Short Film: Starry Skies by Sarah Schmidt, determined by public vote. Organized by Urban Institute for Contemporary Arts (UICA) - Open Projector Night with presenting sponsor, Michigan Film and Digital Media Office. HopCat WYCE ArtPrize Song of the Year: Shine by Molly, determined by public vote. Organized by WYCE with presenting sponsor, HopCat. Youth Collaboration Award: More Than Words by Zeeland Public Schools: Adams Elementary at Courtyard Marriott Downtown, determined by public vote. Organized and sponsored by Western Michigan University - Grand Rapids. Youth Collaboration Award: Creation: 20 Paneled Public Art by LAKELAND CARDINAL COLLABORATIVE at Zoup! @ Medical Mile Food Court, determined by independent jury. Organized and sponsored by Western Michigan University - Grand Rapids. Educator Award: Cities of Silhouettes: A Visual Journal by Missy Dunaway at The Artist’s Studio, determined by independent jury. Organized and sponsored by Western Michigan University - Grand Rapids. Contemporary Black Art Award: 108 Death Masks: A Communal Prayer for Peace and Justice by Nikesha Breeze at DeVos Place Convention Center, determined by independent jury. Organized by The African American Art and Music Celebration with presenting sponsor, City of Grand Rapids. Artista Latino Award: THE STRING PROJECT by Chelsea Nix & Mariano Cortez at DeVos Place Convention Center, determined by public vote. Organized by the West Michigan Hispanic Chamber of Commerce with presenting sponsor, City of Grand Rapids. Asian Artist Award: Black Panther by YanFang Inlow at Grand Rapids Police Department, determined by public vote. Organized by the West Michigan Asian American Association with presenting sponsor, City of Grand Rapids. Asian Artist Award: Pure Michigan by Huaming Wang at DeVos Place Convention Center, determined by public vote. Organized by the West Michigan Asian American Association with presenting sponsor, City of Grand Rapids. Decon + Reuse Vote Award: Abiding In The Shadow by Jeff Best at Amway Grand Plaza Hotel, determined by public vote. Organized and sponsored by The Building Materials Reuse Association. American Civil Liberties Union Award: By Her Own Hand by Lora Robertson, determined by independent jury. Organized by Fountain Street Church with presenting sponsor, ACLU. Social Action Committee Award: Reverse Alchemy by Anthony Thompson, determined by independent jury. Organized by Fountain Street Church with presenting sponsor, ACLU. ArtPrize visitors will once again have the opportunity to voice their opinions and decide the winners of over $200,000 in prizes. Round 2 Voting will begin at 2 p.m. ET today, September 30 and will run through October 4 at Midnight ET. Visitors can cast up to forty votes, one per finalist, and ArtPrize encourages visitors to consider voting for at least one entry in each category. 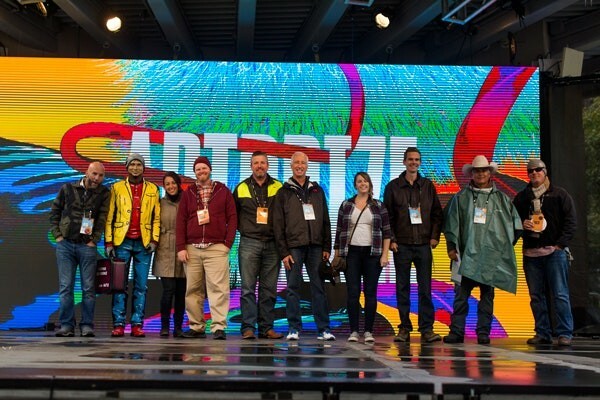 The winners of both the public and juried awards totaling $500,000 will be announced at the Tenth Annual ArtPrize Awards Ceremony, presented by the DTE Energy Foundation, on October 5.